Aztec Amusements is one of the largest suppliers of coin operated amusements in the state of California. We are family owned and operated. We have proudly been serving San Diego for over 25 years. We started out as a vending company, but truth be told, we have not served an Ice cold Coca-Cola out of one of our machines in years. So it was about time that we update our name from Aztec Vending Services to Aztec Amusement Services. Otherwise we are still the same great company as before. Aztec has a large and diversified customer base. Our reputation for supplying timely and efficient repair service on our field equipment is second to none. Our technicians are on call 24/7 all year round. If there is ever an issue or a problem with one of our units we fix it quickly. Supplying state of the art internet powered Jukeboxes and all other types of Amusements to businesses on a commission basis. Buying New and Used Arcade and Pinball Games from homeowners at Great Prices. Renting Photo Booths for Weddings and other special events. Providing Personal Care and Service to all of our customers. 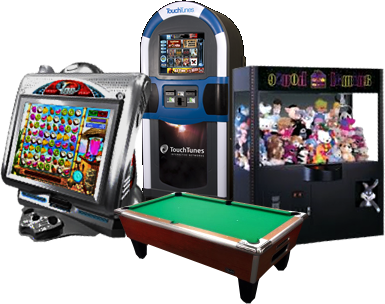 We have been providing high-quality, state-of-the-art jukeboxes, video games, driving simulators, pool tables, pinball, air hockey, dart boards, redemption games, and other on-premise entertainment games to businesses for over 25 years.